See by Chloe is one of my favorite diffusion lines. It always has a chic, quirky take on what's going on in fashion, but its pieces never look dated or trendy. The Marti shoulder bag is a great example of the label's hip aesthetic. I should admit right up front that I adore this bag. It has a sweet 70s vibe that is fresh and vibrant. The soft blue leather is a fabulous alternative to black for summer, and will go perfectly with all those nautical trends that we've been seeing on the streets. The gently scalloped shape of the bag is both attractive and ergonomic. Worn across the body, it will fit right into your hip with no hard edges. The long, thick strap is made for comfort, but it also adds to the retro appeal. Plus, it's adjustable, so you can customize the way it hugs your curves. I've never been a fan of zipper-edged bows, but the sculptural version on the Marti is making me change my mind a little. They are a great addition to the flap front of the bag. 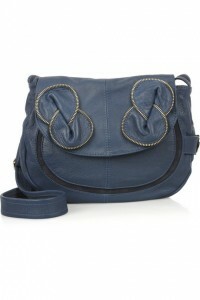 The inset suede detail on the front of the bag mimics its shape and adds another layer of texture. At $455, the Marti is a reasonably-priced designer bag, but for recessionistas like me, it's still a little out of reach. I'll be keeping my eye out for those summer sales. The Botkier Jaden Hobo, an edgy black alternative to this bag.